The Future's Rosie: It's a rollover! Wow that last post is a tough act to follow. I'm certainly feeling the pressure writing this one! 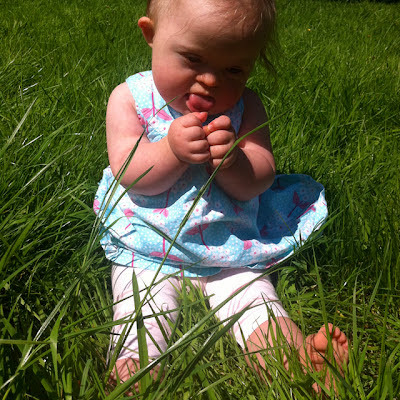 I have been asked before if I deliberately just put happy pictures of Rosie on here, but the truth is she is always smiling, such a happy baby – it's not hard to catch a smile with her – that's how we can tell when she's unwell…she no longer smiles. Unfortunately that happened a few days ago and the anxiety crept back in as she began coughing again, keeping us up the majority of the night. I'm happy to report that it appears to have been just a short spell of common cold and thankfully not a return to her bronchiolitis. She is definitely back on top form now. 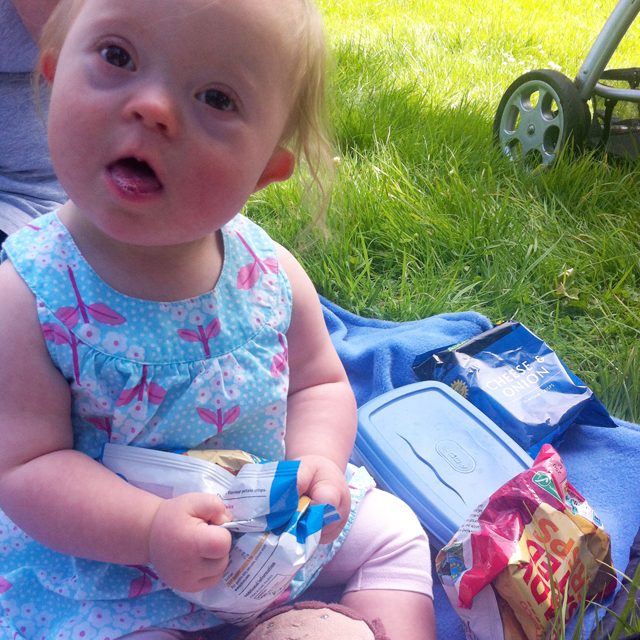 We have enjoyed a great weekend with our friends and took a stroll to Styal Mill (bit of a family favourite) where we had a picnic – outside and everything! 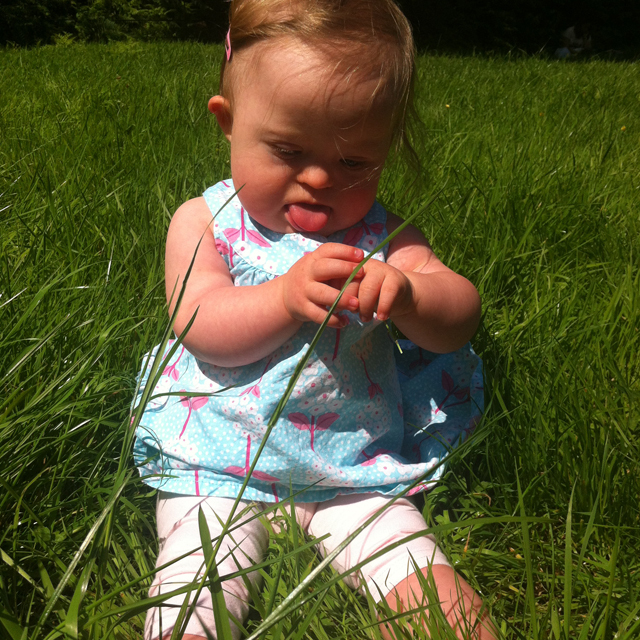 Rosie enjoyed playing in the long grass and examining buttercups, well picking them off and tossing them away. 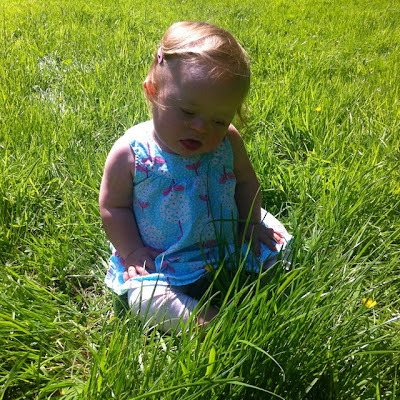 The sunshine has not only given us the chance of enjoying the outdoors again but also helped Rosie discover new things, like shadows, trying to catch and pick them up. She is doing a lot with her hands now and finds them of great interest – she has even began talking and shouting at them which I'm guessing is some kind of step in the right direction to something or other?! Either way it's very cute and funny! The big achievement this week for Rosie has been her rolling over and pushing up onto her hands, again a sure sign the physio tips are working and well worth persevering with. We encourage her by rolling ourselves first, then she copies, finding the whole thing really entertaining – at one point she even rolled over to her front and shuffled back a short distance. This is great as it shows early signs of discovering the ability to move from one place to another by herself. I also had an interesting chat with Joe (6) this weekend. It's all too easy to forget how young he is and assume he 'gets' stuff, but when he comes out with questions such as, "Did I have Down's syndrome when I was a baby Dad?" 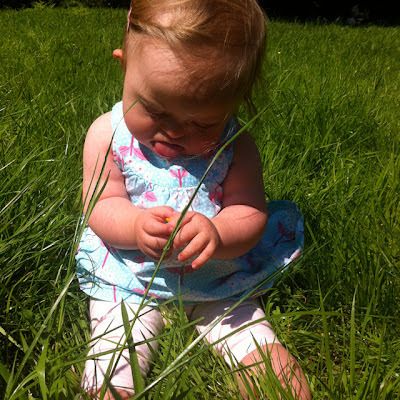 and "Will Rosie have Down's syndrome when she's older?" it really hits home where he is at with understanding it all. I will be making a conscious effort to find resources that help inform young siblings about DS because to be truthful my knowledge is still very limited and I don't feel I can explain things that well, certainly not to a six year old – anyone reading this with good ideas please fire them over so I am better prepared when he wants to talk about it and ask questions in the future! Great post. Good rolling Rosie. Here's Mia's post about Natty for Joe http://www.downssideup.com/2012/02/mias-mini-blog-about-her-sister-natty.html. Also the book Paint The Octopus Red is perfection.